Linguistic Note: a), woman. Awa, snail; dimple, depression, water-worn hole. b), covert; hole; hiding-place. Also c), still pond; stagnant water. a/wa, frog. Description: Great Creatrix of ancient eminence; Moulder of humanity from primordial mud; Rainbow Dragon; Arranger of the Universe; Evolver of the patterns of nature; Orderer of the earthly seasons; of the dome of sky; She Whose gauzy skirt is the blue-sky; Goddess of rain, wind, waters and fertility; "Transformer of the myriad creatures"; Sovereign of wood; Spirit of rain pools; She Who has Her mountains, grottoes and secret haunts; She Who has the virtuous endowments of a divine sage; Goddess of Go-betweens; Arranger of Marriages. She is associated with singing; and with walled cities, of which She had built the prototype. Iconography: Some say She has a long head with two fleshy horns, Her body resembling that of a snail. She is also depeicted with a human head and snake's body. To Whom Sacred: willow; fish, especially carp (She sometimes has the tail of a fish or scaly tail of a serpent); moist and slippery creatures; frog; snail; the number 5 (or 5 colours: She mended the vault of heaven with melted stones of five colors); tortoise; burned reeds; the sound of ghostly drumming; sword. Male Associates: consort and brother: Fu-Hsi, proto muscian and creator spirit. Sometimes identified with Hsi-Ho, ---, see below. Sources: Schafer, DW 37-41, 61-4, 92; M.EA 92, Werner DCM 334-335. Description: Archaic Goddess of the sun. 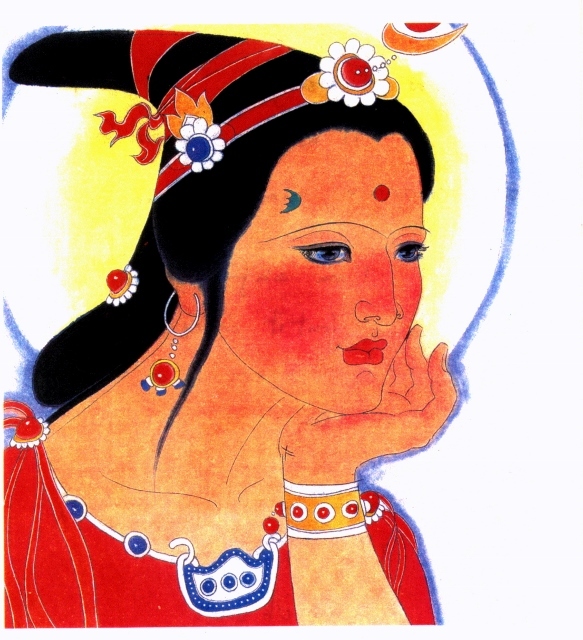 Sometimes identified with: Hsi-Wang-Mu, Queen-Mother-of-the-West. sometimes identified with: Nü-Kua, Earth-Woman. worked on: November 1996; August 14, 1990; August 3, 1991.